SOAPware DocumentationSOAPware FAQ'sFAQ's SOAPware Cloud SolutionQ: How do I import images into a chart via the Remote Desktop? A: The concept of importing images is very simple. This process is documented for end-users who wish to transfer files from their local computer (client) to the SCS server (server), to import into SOAPware, or to utilize their virtual server as an cloud repository for documents. In response to this need, we have responded with a utility called “DocTrans”. This small utility transfers files from the client’s computer to the server. The files can then be transferred into SOAPware using SOAPware’s “Document Importer” or transferred to a folder of the end-users choice. Your local C:\ drive must have a folder with the exact name of “shstrans” (C:\shstrans). If you don’t have the knowledge or authority to make this folder, please see your system administrator. The folder on the server should already exist, if not please call support at 800-455-7627. Configuration of the “Remote Desktop Connection” application is required for the DocTrans.exe to work. 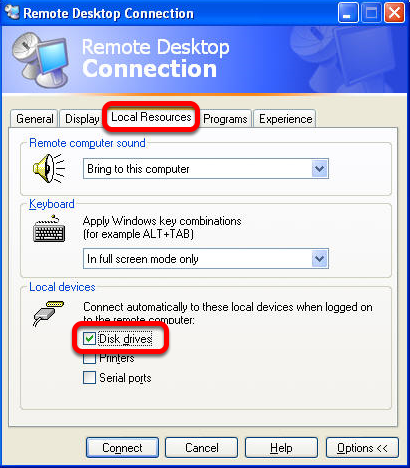 Open the Remote Desktop Connection application on your computer (client). Choose the Local Resources tab. In the Local devices and resources section, click the More button. The second RDP dialog box will be displayed. Check the box next to Drives. Connect as you normally would, however, at this point you may receive a security notice that you are going to be connecting your drives to the Remote Desktop Computer. This is expected, and is the function we want. At this point, the configuration steps are finished on this PC & only need to be completed once on each of the client computers you use. Make sure the Options button is clicked to display the Option tabs. Under the section Local devices and resources click the More button. Make sure your C:\ drive is selected. Click OK and then back to the General tab. At this point, you have the folder created and the Remote Desktop Connection application configured to connect your C:\ drive to the server. You can now save/drop any Image/Document(s) into the C: \shstrans folder on your local computer. Double-click the DocTrans application on the server desktop, and the contents of the SCS trans folder will be uploaded to the server. You will see a DOS window appear showing you that status of the image/document(s) transfer, once complete a window will appear displaying the contents of the C:\shstrans folder. Double-click the SOAPware Icon & login to SOAPware as you normally do. 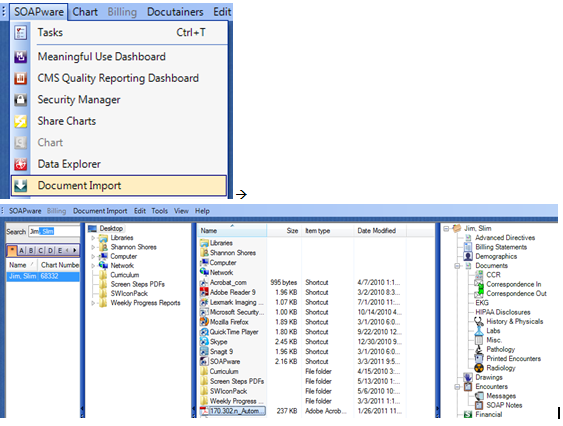 Once SOAPware is open, click SOAPware > Document Import > the Document Importer Workspace will appear, which contains 4-panes to operate in: Chart Rack, Drive/Folder Selection, File Selection, & Chart Section. In the Chart Rack Pane, pick a patient > in the Drive/Folder Selection Pane, pick a location to browse for your files; in this example it would be C:\shstrans > in the File Selection Pane, select the file(s) you want & drag them to the Chart Section you would like them saved in. You have successfully imported your Image/Document(s) into SOAPware. The DocTrans will only transfer 10MB or less at a time. This protects you from using all your bandwidth for long periods of time. The DocTrans will overwrite existing files with the same name. For example if you have a scan called MRI.jpg in the server's C:\shstrans folder and you upload another file called MRI.jpg, it will overwrite the first. The DocTrans only moves files from the clients C:\shstrans to the servers C:\shstrans, it doesn’t move them the reverse direction. The DocTrans places the documents on the server for easy import into SOAPware, it does not move them into SOAPware. Once a document has been moved into SOAPware with the “Document Importer” it can then be deleted from the server's C:\shstrans folder. This is actually encouraged as you don’t want to use all your free space on the C:\ drive with documents. Previous Lesson: Q: How do I log out/disconnect from my SOAPware ASP Server? Next Lesson: Q: How do I connect to the SOAPware Cloud server?